The news was announced at the annual conference of the European Geosciences Union (EGU) in Vienna. Their mission, called “Beyond EPICA-Oldest Ice”, will take place 30 kilometers (18.5 miles) away from the Concordia Research Station in what is a two-hour snowmobile ride to work. The team finalized their location using radar and test drillings at depths of up to 400 meters (1,300 feet). Three criteria had to be met before they could gear up for a chilly five years: the ice is at least 1.5 million years old, there is a high chance of good resolution for scientific research, and the layers are undisturbed. The current record for oldest ice core is 800,000 years old, taken by the European Project for Ice Coring (EPICA) project, an analysis of which revealed CO2 concentrations in the atmosphere over hundreds of thousands of years. These cores are records of ice that have built up over millennia – long icicle scrolls of sorts that have preserved knowledge of Earth’s ancient atmosphere. 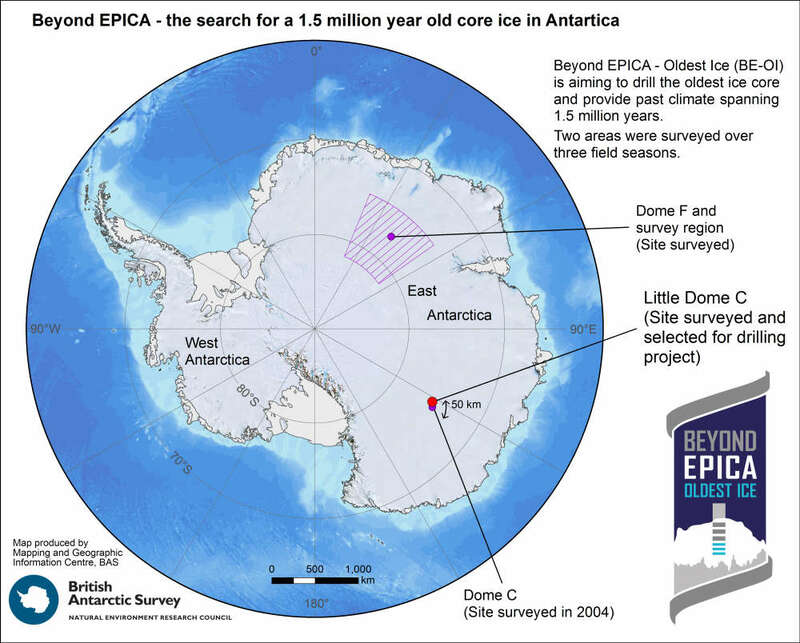 The EPICA ice core provided scientists with plenty of information, but it also presented them with a mystery. They found that starting around 900,000 years ago, the climate changed from 40,000-year cycles to 100,000-year cycles. Researchers in the field don’t know why. The team suspect the reason has to do with greenhouse gases, but until they gather more evidence, they can’t say for certain. That’s where the Beyond EPICA-Oldest Ice mission enters the investigation. “After having analyzed the 800,000-year-old samples taken from the EPICA ice cores, we believe that there is good reason to drill into ice that is at least 1.5 million years old in order to get more information,” said mission coordinator Olaf Eisen from the Alfred Wegener Institute (AWI) in Bremerhaven. Sounds like good basic research. But they throw that away with ‘The team suspect the reason has to do with greenhouse gases.’ So it’s not basic research, it’s pin the tail on the CO2. they’ll keep drilling and drilling until they get an ice core or other source that supports the CO2 as cause BS. Then, like Briffa’s trees, they throw out anything that does not support the preconceived notion of CAGW. Glacial-interglacial alternation is flicker, at the transition between one state and another. The first state, pre Pleistocene, was non glacial. The second state, post Pleistocene, will be deep uninterrupted glacial. Like the Sturtian or Marinoan, or Saharan-Andean. The rate of flicker is slowing. The end of the flickering transition is not too far off (in geological terms). Dakos V, van Nes EH, Scheffer M. Flickering as an early warning signal. Theoretical Ecology. 2013 Aug 1;6(3):309-17. Most work on generic early warning signals for critical transitions focuses on indicators of the phenomenon of critical slowing down that precedes a range of catastroph- ic bifurcation points. However, in highly stochastic environ- ments, systems will tend to shift to alternative basins of attraction already far from such bifurcation points. In fact, strong perturbations (noise) may cause the system to “flicker” between the basins of attraction of the system’s alternative states. As a result, under such noisy conditions, critical slowing down is not relevant, and one would expect its related generic leading indicators to fail, signaling an impending transition. Here, we systematically explore how flickering may be detected and interpreted as a signal of an emerging alternative attractor. We show that—although the two mechanisms differ—flickering may often be reflected in rising variance, lag-1 autocorrelation and skewness in ways that resemble the effects of critical slowing down. In partic- ular, we demonstrate how the probability distribution of a flickering system can be used to map potential alternative attractors and their resilience. Thus, while flickering systems differ in many ways from the classical image of critical transitions, changes in their dynamics may carry valuable information about upcoming major changes. There is a simple answer and it has nothing to do with so-called greenhouse. CO2 solubility in the oceans decreases with increasing temperature. When the oceans warm less CO2 is absorbed and at the surface CO2 is emitted. Surveys by planes with instruments to measure CO2 have to their surprise (but not to anyone one that understands) found that CO2 over the tropical Atlantic ocean off Brazil is higher than over industrial areas of China and Europe. Another pointer is that the pH of the waters around tropical Pacific Islands is in the range of 8.1 to 8.3 in comparison to cold waters off the coast of Canada and Siberia in the range 7.6 to 7.8. ( by the way the so called ocean acidification is rubbish, everywhere the ocean has a pH above the neutral level of 7.0 ie oceans are basic) More CO2 in the atmosphere and more rainfall makes plants grow Plant growth and rain are associated with more clouds which reduce incoming radiant heat from the sun. There are short cycles of drought, and floods and there are longer cycles associated with the movement of ocean currents and land changes. After the flickering stops, the interglacial lights go out? The dark ages, where alleged scientists were afraid to question assumptions. Are we ‘looking under the lamp-post’ because there is no wish to find what we are looking for? See Steve Milloy’s comment below the NYT report. Ice core samples dating back 800,000 years reveal that warming historically PRECEDED rises in CO2 (rather than CO2 leading warming). There are other proxies that correlate chronologically, but teasing out the steps in the cyclic changes is still enigmatic. Except that it is obvious there is much more than just ‘climate’ change involved. 6200bce (the 8k2 BP event) is an important marker. Ocean outgassing and absorption of CO2, a big part of the carbon cycle. Warming oceans = more CO2 going into the atmosphere, less into the oceans.